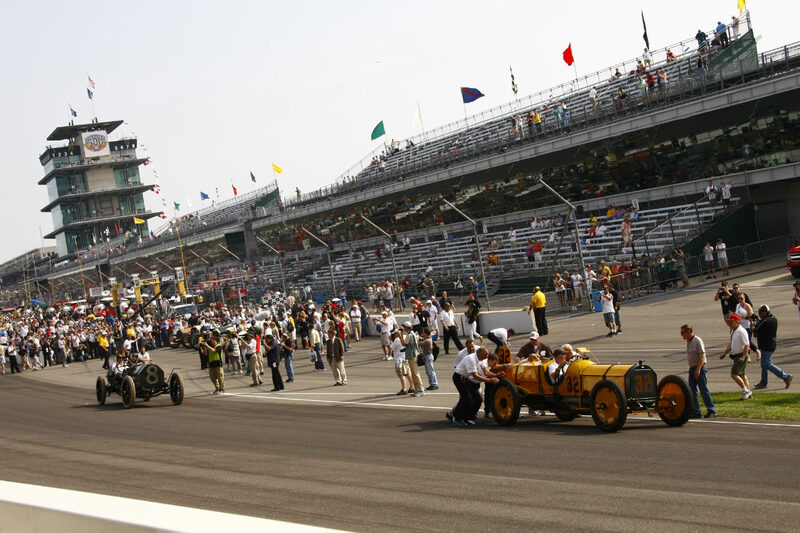 Seven cars participated in the parade lap to celebrate the 100th anniversary of the 1911 Indy 500 Race. 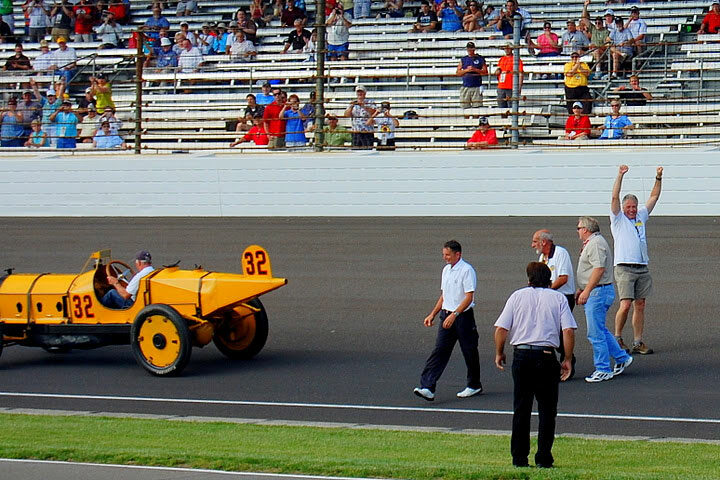 The parade was led by the historic Marmon Wasp, the winner of the Inaugural Indy 500. 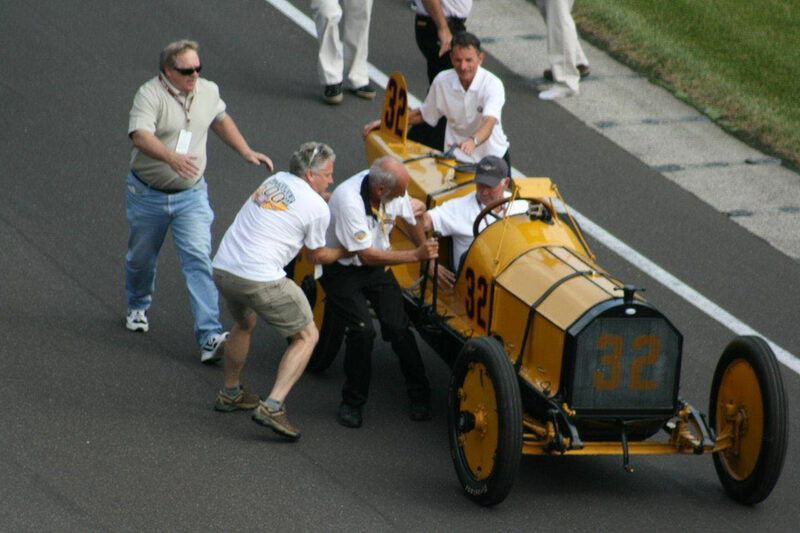 This racer is owned by the Indianapolis Motor Speedway Hall of Fame Museum and has been cared for years by AJ Fairbairn. 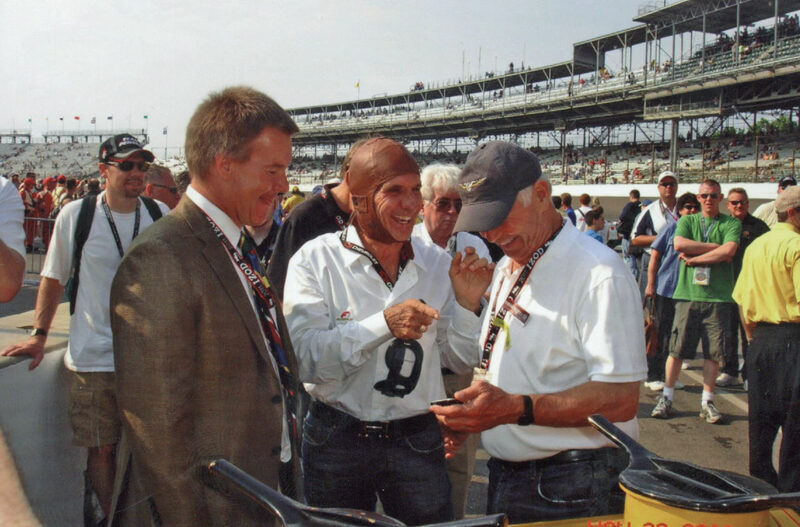 Before the parade, Indy legends Emmerson Fittipaldi (center), driver of the Alco Black Beast, and Parnelli Jones (right), driver of the Marmon Wasp, shared some Indy tales. 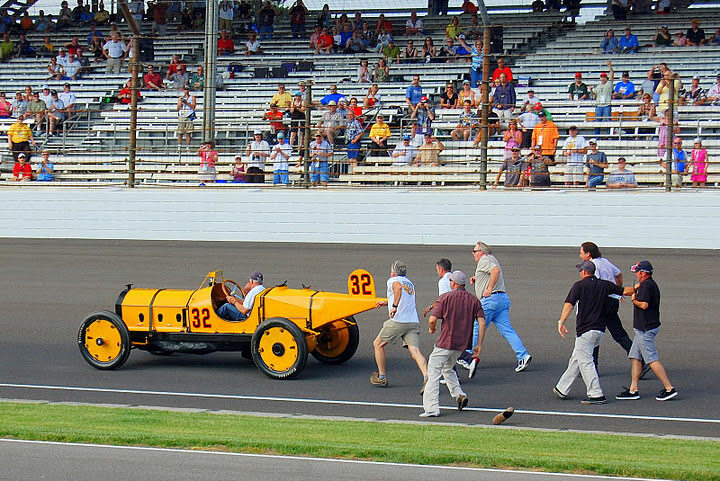 The Marmon Wasp had the honor of leading the parade lap followed by the Alco Black Beast. 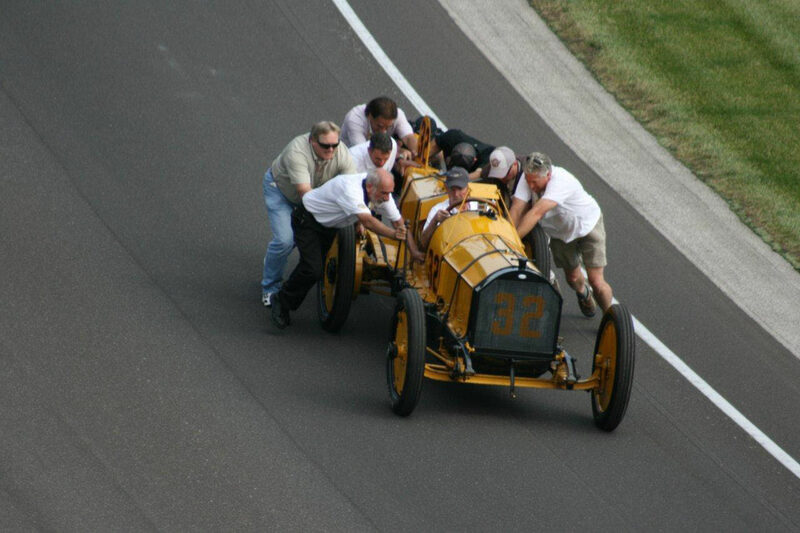 After only 500 feet, the Marmon stalled and required a push start. 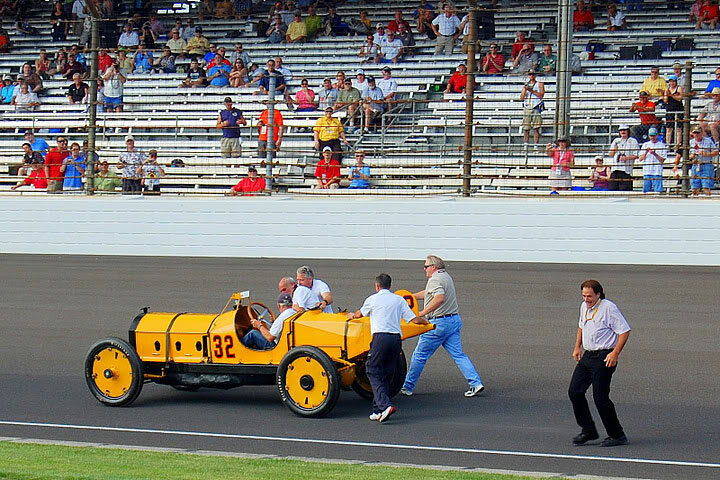 The moment was captured by my lap camera, IMS photographers, spectators Regie Moritz and Shelly Hudson. 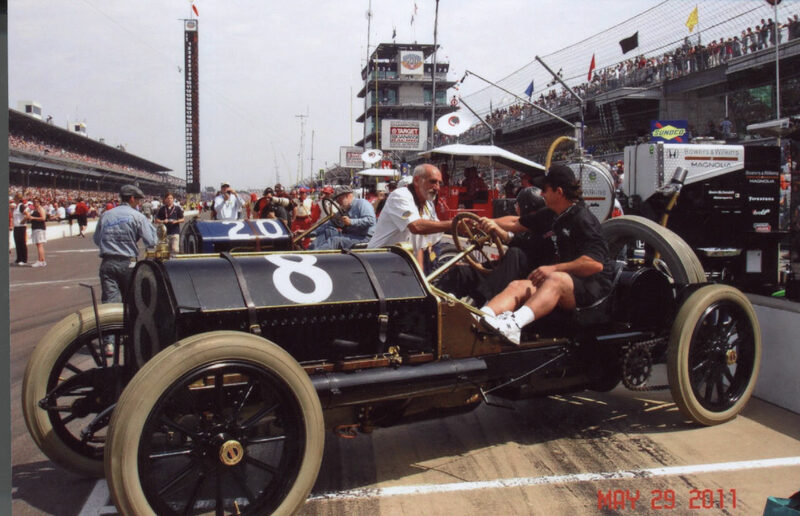 Shelly is the wife of Paul Hudson who helped restart the Marmon and can be seen here on the far right (wearing shorts and a white Indy 500 shirt). Paul Hudson recalls the moment: "I was helping push the Wasp to try to get it started. When it finally fired up, AJ the mechanic fell and was being dragged down the track. I ran around and picked him before he was run over by the rear wheel. My wife got pictures of the whole event and I would love to share them with you. Truly one of the greatest experiences of my life!" After AJ was dragged for several yards, Paul jumped to the side of the Wasp to assist AJ while Parnelli Jones brought the racer to a stop. 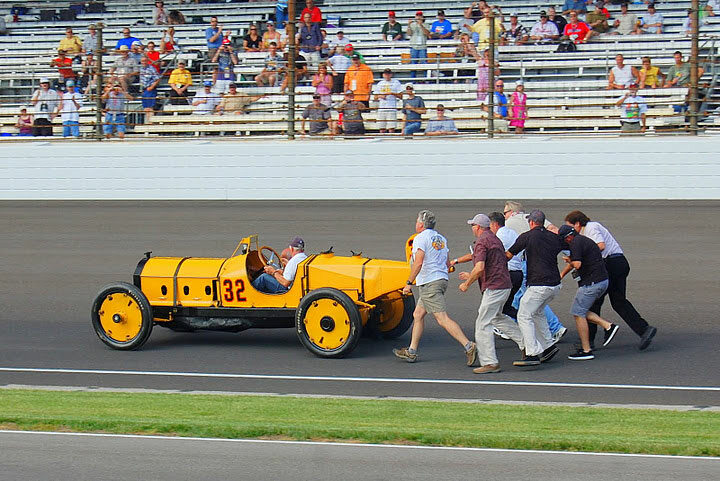 A happy ending- The Marmon Wasp ran and successfully completed the parade laps, AJ was uninjured and the Marmon team was thrilled. That's Paul in a "Rocky" pose. 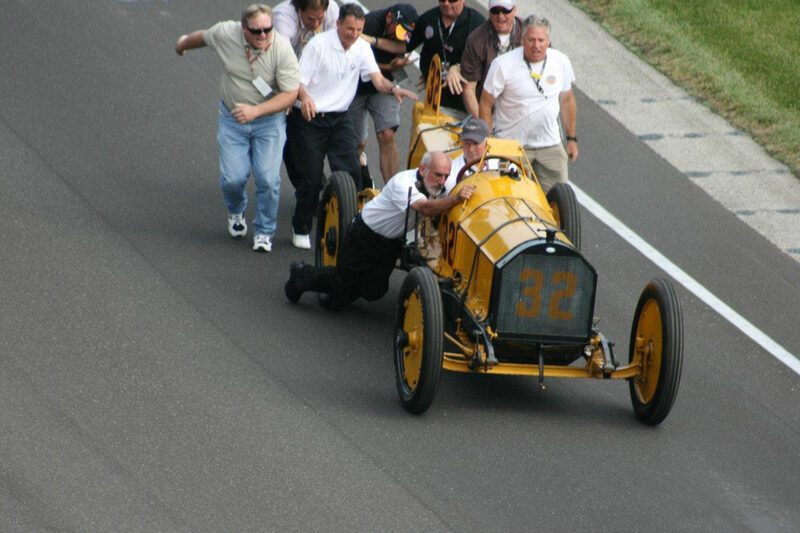 AJ congratulating the Alco Black Beast team (Howard Kroplick and mechanic Sam Greco) after its successful run. Paul and the Marmon Wasp after the parade. Super job, Paul- You were the hero of the parade lap!!! 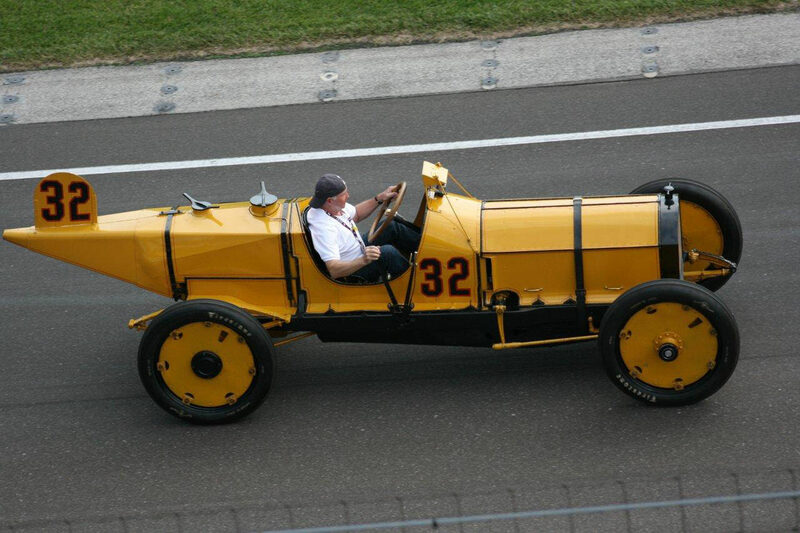 When was it that the Marmon Wasp threw a rod? I thought it was on the parade lap, no? Whatever, it did throw a rod at some point and is currently being rebuilt. 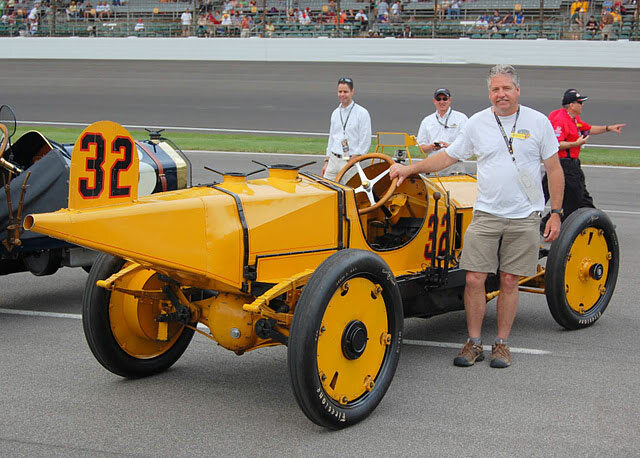 This is a truly amazing assemblage of historic materials about the storied Marmon Wasp #32. Thanks to all contributors to this blog. Automotive history/archaeology at its best ! !